I love the story in Luke 2:41-50 when Mary & Joseph took their teenage boy Jesus to Jerusalem to celebrate the Passover feast. At the end of the celebration they headed home but somehow they forgot to bring Jesus with them! Stressed out, they went back to Jerusalem and found Jesus sitting in the temple listening to the teachers and asking them questions. When they asked Jesus why He decided to stay behind, He seemed perplexed and asked them a question in turn... Didn't you know that I would be about My Father's business? We know that Jesus was not being cheeky to His parents, but was genuine is sharing His heart with His parents. If I was to speculate, I would wonder if Jesus responded to His parents in the way He did because He was now at an age (Bar Mitzvah) where it was Jewish tradition to transfer the son into the father’s care? Whatever the reason, we can clearly see that Jesus saw Himself as being part of His heavenly Dad's business even as a teenager. In a healthy relationship, sons work with their fathers, not for their fathers. The heart of a loving son is to be part of everything that His Dad is doing (John 5:19-20). An orphan at heart on the other hand feels no such connection. A good example of an orphan mindset is the elder brother in the prodigal son story in Luke 15:11-31. Though everything that belonged to his father already belonged to him, he actually saw himself as being a slave to his father. Even though he was the oldest son and privy to a double portion of his father's inheritance, he saw himself as a slave out in his father's field. I am thankful that the father in the story showed as much love to the older brother as he did to the younger brother and invited him to come in and join the party. Those of us who still struggle with orphan mindsets might feel the same way if we are not convinced that we are truly part of our Heavenly Dad's business. In the prodigal son story, the father told the elder brother that everything that he had belonged to him. Yet, the son struggled to believe that was true and chose to wallow in bitterness and resentment. We don't know whether he chose to accept his father's invitation and join the party or not. I certainly hope he did for his sake. The truth is that every person who has received Christ into their lives has become born again and is now a legitimate member of the family of God. While we became legal sons the moment we were born again, it is a process for us to grow in our sonship so that we become sons from our heart. The more that we live in a heart relationship with our Father, the more that we will naturally be about His business in whatever we choose to do. Whether that is raising the dead or playing with our grand kids. My prayer is that our Father would reveal that we really do belong to him and that everything He has already belongs to us in Christ. 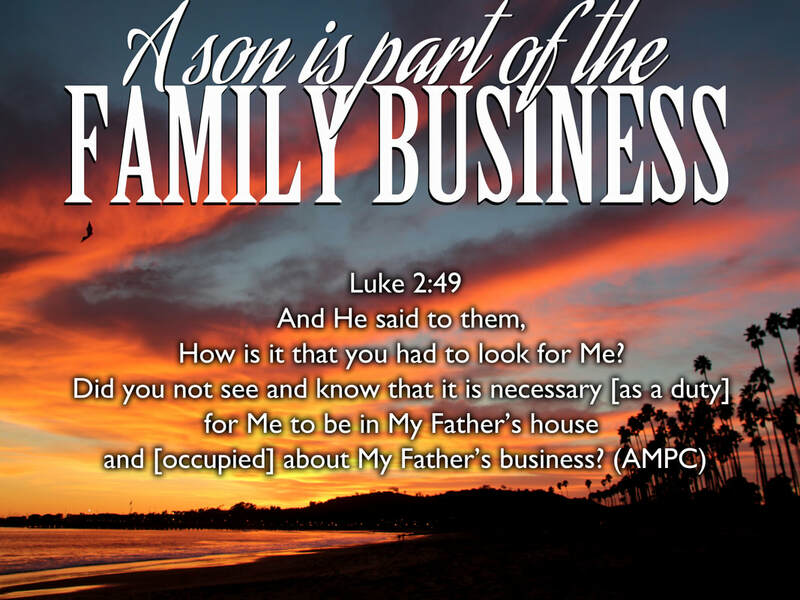 I pray that we would know that we are automatically part of the family business by virtue of our new birth in the Kingdom. Whether we know it or not, our Father sees us as His beloved children (1 John 3:1) and is delighted to give His kingdom to us (Luke 12:32) are part of our inheritance package. May we all know that we are not on the outside looking in, but on the inside looking out! If you relate more to the elder brother in the prodigal son story, my encouragement to you is to ask God to show you your place in His family. He bids you to come into His house, join the party and know that everything that belongs to Him belongs to you simply because you are one of His heirs.